I think I give the impression that I'm more well-read than I am. I certainly know of many authors, but I haven't read much, if any, of their works. For example, despite enjoying science fiction a great deal, I've never actually read anything by Issac Asimov. Or Robert Heinlein. Or Harlan Ellison. Or Ray Bradbury. I've read or seen some works based on their writing, but I've never actually read anything they themselves wrote. The same holds true of Octavia Butler. I'm familiar with her name and reputation, but I've never actually sat down to read her work. 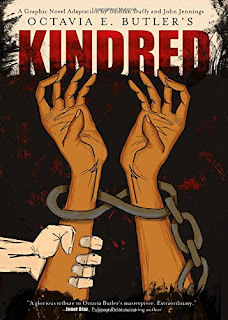 Which means that, in reviewing Damian Duffy's and John Jennings' graphic novel adaptation of Kindred, I can't compare their translation to her original. I don't know what they might have left out, changed, or added. 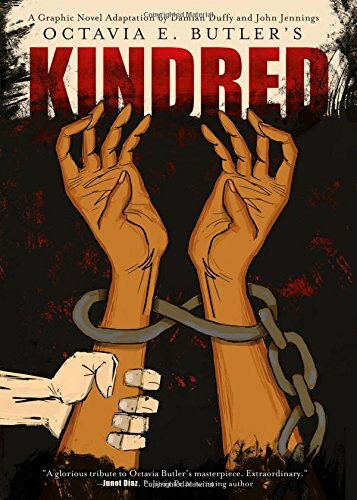 However, I can tell you that, regardless of how close they adhered to the source, the Kindred graphic novel is an excellent read! The story revolves around Dana, a Black woman in 1976 who's trying to make it as a writer. She mysteriously finds herself transported back to the early 1800s where she saves a child from drowning. She proceeds to flip back and forth through time, arriving in the past just in time to save the same child (and, later, adult) from similar mishaps. Being as she's a Black woman in the pre-Civil War southern United States, however, she finds herself having to contend with any number of slavery-related issues, not the least of which is her getting beaten within an inch of her life. Despite the story taking only a few months in 1976, her trips to the past take considerably longer and have years-long stretches between them, meaning that she watches as the same families grow over the course of a couple decades. She learns that many of those she encounters are, in fact, distant ancestors, and she does what she can to help them. The story finally ends when the child she originally saved, now a full adult, dies and Dana returns home to try to do some research to learn about what ultimately happened to everyone. The story is a powerful one. Not only does it point out many of the commonly known injustices that slaves, and even freed Blacks, faced in the 1800s, it draws out a lot of the ones that were much less well-known in 1979 (when Butler first wrote the story) and even not-widely-acknowledged today in 2017. Particularly when it comes to personal relationships between owners and "favored" slaves, and those "favored" slaves with other slaves. Furthermore, it showcases how little power Blacks had, even when they were free and well-educated; Dana frequently has her agency stripped from her, even when she's back in time with her white, 1976-era husband. But beyond just commenting on the past, the story also notes our general ignorance of that past today. Dana and her husband repeatedly are at a loss for some basic information about how things worked back in the 1800s. They have some general notions and half-remembered nuggets they're able to draw upon, but they don't have much to work with, even after going to the library to do proper research. (1976, you'll recall, was before the internet.) Dana even mentions multiple times how she's unfamiliar with much of her own family's history, and most of what she does know is relegated to a hand-drawn family tree in an heirloom Bible. As I said, I can't really differentiate much in the way of who contributed what to the story as it's presented here, but from what I know of Butler's reputation, I don't think anything substantial was added or changed. Duffy's script does a good job of letting the art speak for whatever descriptions Butler wrote, and he seems to capture many (most? all?) of the dialogue and Dana's internal monologue so that, if I didn't know any better, I'd assume this was written AS a graphic novel in the first place. Jennings' art is well-suited to the story, too. I've enjoyed his style since I first came across his work about five years ago, and his rough, scratchy quality lends itself to the emotional and physical roughness Dana endures in the past. Butler has been called the "grande dame of science fiction" so I don't know why we haven't seen her works adapted to other media before now. But if Kindred sells as well as it ought to, then I suspect we'll see more of her work crossing over into comic formats. Here's to hoping Duffy and Jennings are tapped for those as well!